A curious cow at her best! 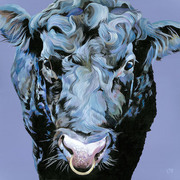 This image of English Longhorn, Holly was donated to me by a young farmer, Nathan via Twitter. I always say that cows have inquisitive personality and Holly’s shines through. I especially love the vibrant colours in this painting, they really capture the essence of modern photography.